See what our past and current clients have to say about our services and approach. These are genuine testimonials that our clients have sent us and we have on file. 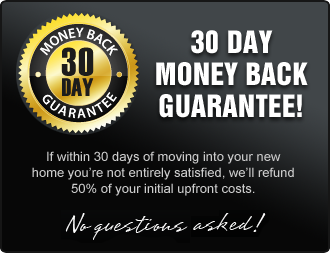 We don’t fabricate or manufacture testimonials like some other builders. “After building a project home six years ago, we were left wanting, and had a long list of needs that hadn’t been met in the design and quality of the big box builder. For our new home we knew what we wanted but couldn’t find anything we liked on the market, so we took the plunge to custom build and in the process made an amazing discovery – Leanne Irvine of Custom Home Designs. I have told family and friends that I liken Leanne to a wizard with a magic wand! My husband and I had a list of all of the individual elements that we wanted in our new home, but we had no idea how we could pull them together – in step Custom Home Designs. The design process has been easy and convenient throughout, with an incredible communication process including phone calls, text messages, e-mails and even Skype updates. To understand our needs Leanne visited us at our home to understand our current lifestyle, and allowed me to bombard her with all of the pictures and design ideas we had gathered on Houzz and Pinterest. As a result Leanne and her team have designed an amazing home for us that we are incredibly proud of, it ticks all of our boxes, and even includes a secret room for my daughters. If you are considering building a custom home, stop looking, Custom Home Designs will make your dreams come true. “Alex, Custom Home Designs is just fantastic and their level of service is second to none and most importantly are extremely flexible to meet your design requirements and will follow it through until completion. For a matter of interest we commence building next week in Brookwater, before we could start the build we had to get it passed through the Brookwater Architect for approval and this is extremely difficult and he is very fussy. But he was very impressed with the design and said it was a “fresh innovation and looking forward to the completion”. Alex, DO NOT WASTE YOUR MONEY ON AN ARCHITECT. Custom Home Designs’ design for our home is exactly what we envisaged and my wife and myself are very excited to start the project. As a matter of interest the builder we chose is going to enter it for a HIA award and is very confident he will win it with this design. The house is moving along well, the roof is on, electrical and plumbing roughing is done and Adrian said the external walls start tomorrow. The main thing is all sub-contractors and builder are very easy and flexible to get along with. Pam and I have made a few adjustments here and there and all involved are very accommodating to help us make these changes. Adrian said we should be in by end of November. As for landscaping Pam is doing two projects in Brookwater and both owners want new plants and different designs as both complain every garden in Brookwater looks the same and Pam agrees and is diligently going about to accommodate them . As for picking Custom Home Designs, all I can say you won’t be sorry, good choice. Custom Home Designs will design you an excellent home which will suit your requirements and will be totally unique. If you also go with Adrian you will also pick a great builder who will also accommodate to your needs without taking any short cuts. 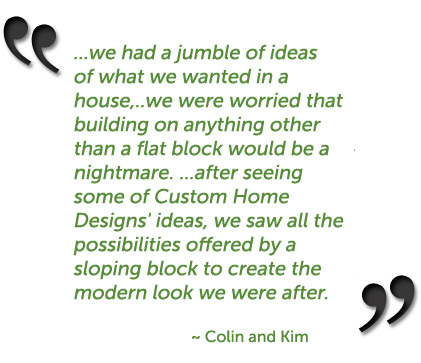 “We first came to know Custom Home Designs when we built our dream home in 2006. Custom Home Designs’ enthusiasm, and fresh take on the design, helped us build this beautiful new house on a very difficult and steep block which no-one else wanted to touch. In fact she was our last resort; we were on the verge of selling the block and forgetting about our vision for a new home. But after just one meeting with Custom Home Designs we knew we had found the right team to help us achieve our dream. Custom Home Designs was fantastic to work with; always happy to listen to the many changes that we came up with as the design progressed, and more importantly to us, they were just as keen as us to ensure that the fabulous views and great breezes, attainable only from the two opposite ends of the block would remain a priority. Being our second home, we wanted something a little more special. Custom Home Designs certainly helped there as they listened and incorporated every detail we came up with, as well as adding many of their own. At the time of meeting Leanne, she was working as a design consultant with one builder, and to that effect we wished she could have remained working with us throughout the rest of the construction, as it would have alleviated many of the problems we later encountered in having to deal with different project managers, all at different stages of the build. We kept saying that the ideal way to build would be to have one person to work with from the design to construction details to the final dressing of the property. And now Leanne Irvine does just this. As your own personal project manager, she is offering this fantastic solution to ensuring that building your dream home is as smooth and efficient as possible. We have no hesitation in recommending Custom Home Designs’ services to anyone interested in building, as we know that they will receive 100% service, 100% enthusiasm, and 100% efficiency; the three things we are all looking for when making the largest investment in our lives – our family home. “We purchased a block in 2006 and in our quest to find the right company to build our home, we were fortunate enough to meet the Custom Home Designs team. 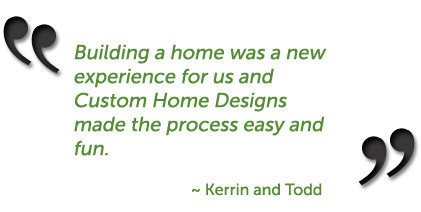 Building a home was a new experience for us and Custom Home Designs made the process easy and fun. 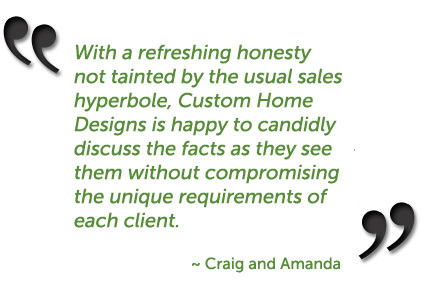 “With a refreshing honesty not tainted by the usual sales hyperbole, Custom Home Designs is happy to candidly discuss the facts as they see them without compromising the unique requirements of each client. We appreciated this approach, as with our limited local knowledge it would have been easy to make decisions that could have cost us dearly, both financially and in the end result. “We had been thinking about building for a while and we had a jumble of ideas of what we wanted in a house. We wanted something more interesting than a “standard” house plan but we were worried that building on anything other than a flat block would be a nightmare. Thankfully, we visited Custom Home Designs before buying our land and, after seeing some of their ideas, we saw all the possibilities offered by a sloping block to create the modern look we were after. After finding THE block (that we never would have considered before), Custom Home Designs worked with us to make the most of our views and the prevailing breezes and incorporate all the things we love about life into our home. The result is everything that we dreamed about! The interior design is interesting, spacious and functional with no wasted areas. Judging by the number of people who stop to photograph our home, the outside of the house is just as interesting too. 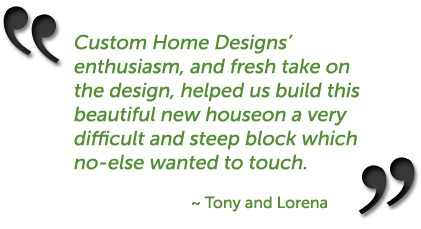 “From the moment we met the Custom Home Designs team we felt at ease. Their honest, open, professional yet personal approach to home design consulting made me personally feel very comfortable and confident about the process of ‘Design and build’ construction which was new to me. The first meeting was at the block of land we had purchased where they asked about what we wanted to build, looked at the direction the block faced, views, weather approaches and the direction the sun rose and set in. All these variables need careful consideration in designing a home and Custom Home Designs ticked all the boxes before starting to think about floor plans. Next came the discussions about our wants and needs in the home. Style, room sizes, relationship of rooms to living spaces, indoor to outdoor connection and practicality of the design, all factors they considered in lead up to the design itself. The results speak for themselves in the final floor plan design which incorporated everything we had asked for. The design was aesthetically pleasing and maintained integrity to the natural surrounds of the area by not destroying the land through excessive cut and fill works. Large cut and fill jobs normally add huge costs to building and leave the area looking like every other estate where standard project homes take precedence over preservation of the natural landscape and contour rather than working with it. Our additional input was considered in tweaking the design to get to a final result which we were excited to be building. Our house is now completed and we moved in just before Christmas (very stressful time) . But we love it our design certainly has street appeal and if we are out in garden strangers come up and congratulate us on our design and construction. Custom Home Designs will certainly design you a wow house, don’t bother with an architect just go with Custom Home Designs and that’s saying something just after you build a house. To answer your questions! 1. We are very happy with design of our house, we stuffed up with the garage it could have been longer, but that’s not Custom Home Designs’ fault they told us to double check all measurements and we missed the garage. But the design overall is out of this world the house is on a sloppy block overlooking the golf course, a lady the other day walking her dog past our house stopped and said to me “If I lived on a golf course I would build a house just like yours with those magnificent big decks”. That says it, has great street appeal. 2. Always contactable if Custom Home Designs are in one their many meetings and you leave a message on the phone, they will always ring you back. Likewise all emails are responded to. For you interest we started planning our home Christmas 2009 twelve months later we moved in. 3. Sloping blocks that is what Custom Home Designs is best at! 4. As far as Custom Home Designs’ fees are, what a bargain go and get an architect’s price and compare . As for building on a sloping block, no matter who you build with, it will always be expensive compared to a flat block. But with Custom Home Designs’ design thry will use the slope of the block to enhance your home to give it real value . In other words it will be totally unique and unlike other homes built by project builders there will be no waste of space and no doubt have a magnificent outlook totally designed for your requirements. Details of the Recommendation: “If you have ever had the pleasure of watching Custom Home Designs work, you would notice their amazing ability to understand what their clients want, all the while creating the structural integrity that a builder needs. They are thorough and articulate which leaves you confident that you as a client were heard! I believe that what sets them apart from other designers is that as a woman, Leanne Irvine understands what women require on a practical level. For an investment of this size these qualities are invaluable. It is just wonderful – all the spaces work well, it is functional and aesthetic, great temprerature all year round – the louvers and the breezway are great, so it pretty much ticks all the boxes. We love the playroom and study nook too. The colours and finishes have all come together in a beautiful package really – awesome landscaping too. And naturally, we have to be grateful for good execution via Steve. Now that we are moved in and much more settled you should come and visit us again – so see how it has come together with our stuff in it. We still haven’t decorated it as I would like as yet, as we are looking for some new pieces of furniture and art for the finishing touches. “It has been a pleasure to work through the design stages for my house at Allambie Heights with Leanne and Michael. My block has a very steep slope (11-13m) and many standard project home builders would not consider anything over 4m – even the ones that say they specialize in sloping blocks. In my initial discussions with Leanne, she said this was not a problem for herself and her team at CHD. I initially hand drew a design and house plan on a piece of paper. Along with a few pictures from the internet and a scan of my hand drawing, Leanne and Michael completed full detailed drawings of what I wanted and even improved on areas which I had not thought of. I couldn’t be happier with the final design. It is extremely well suited for the sloping block with large open spaces that takes advantage of the distant ocean views. Being permanently stationed overseas, it was also important that I had someone in NSW who knew the appropriate builders and consultants (for council approvals), with the required expertise. Leanne handled this aspect very smoothly and gave great advice. She liased with all the specialists ranging from interior, bushfire, geotechnical, landscaping, stormwater, structural, etc. and compiled all the information required for council approval. If you’d like to see more testimonials of our past and current clients, please contact us and we’d be happy to provide more for you.